Video clip synopsis – Behind the scenes of a transmission from Wembley Stadium, seen on Australian television. Broadband MP4 worldseries_bb.mp4 (3.1MB), suitable for iPods and computer downloads. 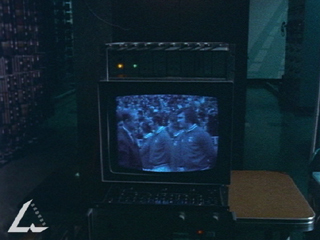 This video clip, showing behind the scenes of a transmission from Wembley Stadium, is an excerpt from the series Australian Report, first produced in 1973. Australian Report is a Commonwealth Film Unit production. This video clip is on the website From Wireless to Web, produced in 2005. World Series Cricket – WSC – reinvented cricket as a spectacular television event. Its day-night games were designed for prime-time broadcasting. The players’ traditional cricket whites were replaced with bright clothes and dramatic night-lights imbued the game with a sense of theatre. Channel Nine’s marketing department developed the jingle, 'C’mon Aussie, c’mon, c’mon’. 50,000 spectators flocked to the Sydney Cricket Ground to watch the first WSC game of 1978 and the matches had brilliant ratings for the Nine Network. Nine’s eight cameras vastly improved the television coverage with views of the game from a range of angles. This enhanced the quality of replays, and for the first time live coverage was combined with computerised statistics, plus player and expert interviews. The innovations in cricket broadcasting that occurred during the WSC era are still felt over twenty years later. What difficulties do you see in covering the following sports? What difficulties do you see in broadcasting sporting events from around the world? You may wish to consider things like time zones, technology/equipment, language and host nation facilities.